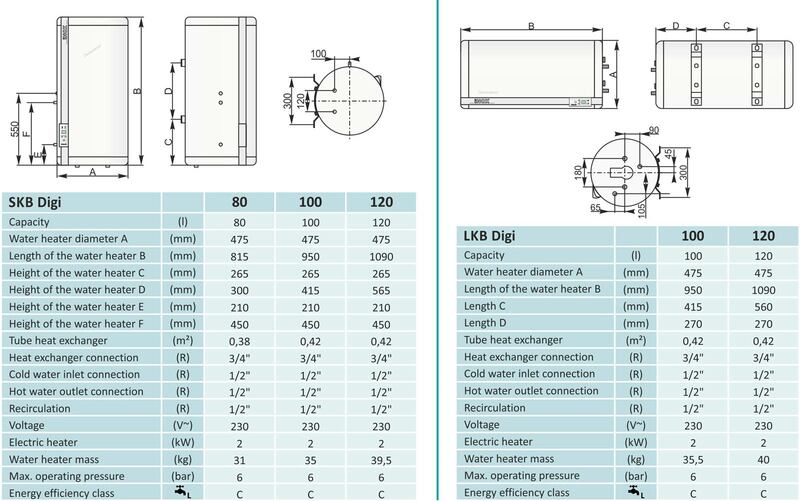 SKB-Digi combined stainless steel hot water heaters with volumes of 80, 100 and 120 litres, and LKB-Digi with volumes of 100 and 120 liitres, with a built in digital controller, are designed for both heating and the accumulation of domestic hot water for households, restaurants and other premises where domestic hot water is needed. The availability of domestic water heating, through the boiler circuit connected to the tube heat exchanger or through the built-in electrical heater, makes these products very attractive. Their main characteristic is their very balanced domestic water flow and pressure, independently of the draining points used. This means that more than one person can draw hot water at the same time. Boilers are made out of stainless steel, which guarantees hygiene. These products are distinguished by the extensive application of modern technologies and their quality of material as well as their fully tested design and build, which makes them safe and reliable. Manufactured in accordance with ISO 9001 and ISO 14001. The accumulated quantity of domestic hot water provides very balanced water flow and pressure, regardless of the draining points being used. A successful blend of modern technology and high quality construction materials with ease of installation and use. They are thermally insulated with mineral wool on Al foil and heat losses due to good and efficient insulation are very small. 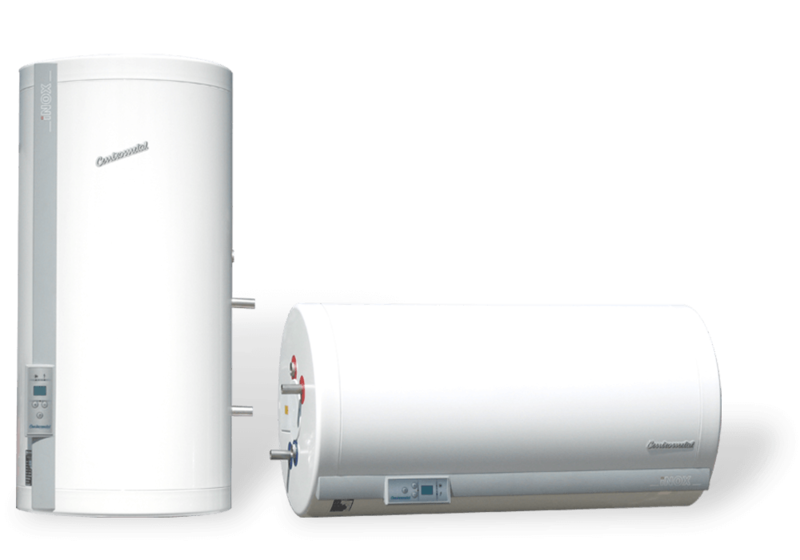 SKB-Digi combined hot water heaters, with volume 80, 100 and 120 litres, and LKB-Digi with volume 100 and 120 litres are engineered for both heating and the accumulation of domestic hot water for household, restaurants and other premises where domestic hot water is needed. 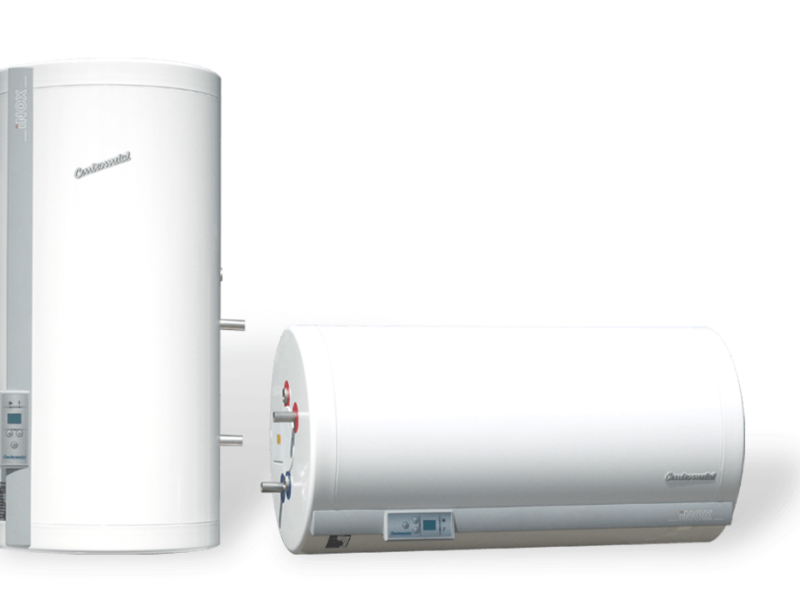 The availability of domestic water heating through the boiler (or solar collector) circuit connected to the tube heat exchanger or through the built-in electrical heater. Engineered to be hung on a wall in the vertical position (SKB-Digi) and horizontal position (LKB-Digi). connections on the right or on the left side. Made of high quality stainless steel, which guarantees high hygienic standards. The accumulated quantity of domestic hot water provides very balanced water flow and pressure, regardless of the draining points being used. This means that more than one person can use hot water in the same time. The big surface and the thin wall tube of the built-in heat exchanger allows rapid heating of the whole water content above 60°C, which prevents creation of legionella. Very precise digital controller of the boiler allows a very precise control of the temperature as well as the choices made regarding the use of heating (electric energy or boiler water). Ability to operate the freezing protection system. Thermal insulation is made of glass wool on aluminium foil which is effective in cutting temperature loss. The availability of the recirculation tube connection allows a ring main configuration for domestic hot water so that hot water is constantly present at the tap, making it unnecessary to draw water before hot water arrives.